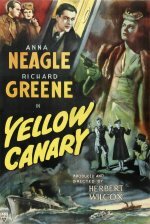 RKO's British unit did its part for the war effort with Yellow Canary (1943), a tale of a socialite posing as a Nazi sympathizer to mask her activities as a British agent. Forced to leave England, ostracized by everyone, including her well-to-do family, she is courted by both a Polish aristocrat and a British naval intelligence officer aboard ship to Canada. By the time the vessel docks, it has become apparent that several of the principals are playing a double game in this thriller fashioned by producer-director Herbert Wilcox for his bride, Anna Neagle.